Minister of State for Gaeltacht Affairs, Joe McHugh TD and Culture Minister Carál Ní Chuilín MLA joined in a celebration of the best of Irish language publishing and the city’s Gaeltacht Quarter gave them a welcome like never before. This year, the winner of Gradam Uí Shúilleabháin for the best book for adults is ‘Anamlón Bliana – ó dhialanna an Ríordánaigh’, edited by Tadhg Ó Dúshláine and published by Cló Iar-Chonnacht . This book gives us a fascinating insight into the tortured mind of poet Seán Ó Riordáin through the diaries he kept from 1940 until his death in 1977. Tadhg, a lecturer of Irish in NUI Maynooth, has written extensively on Irish language literature and has also written short stories and poetry in both Irish and English. 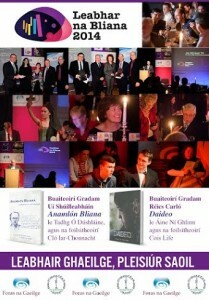 Gradam Réics Carló for the best children’s book was awarded to ‘Daideo’ by Áine Ní Ghlinn and published by Cois Life. This book tells of a chance meeting on a train between a boy on the run from his parents and an old man on the run from his children. An audio version of the book, narrated by the author, is also available on the publisher’s website free of charge. Lecturer, journalist and writer Áine Ní Ghlinn has written twenty two books to date – four poetry collections and eighteen books for teenagers and young people. “Leabhar na Bliana is a unique literary competition which gives special recognition to the outstanding work done by Irish language publishers while at the same time recognising the important role of writers and artists in the process,” said Liam Ó Maolaodha, Director of Oireachtas na Gaeilge. Congratulating the award winners, Foras na Gaeilge Deputy CEO Seán Ó Coinn said “Irish language publishing is part of the drive to cultivate a creative and innovative society. This year’s shortlisted books show how writers, illustrators and publishers are combining their talents and ideas to create beautiful new books. 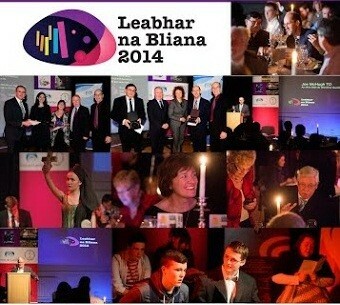 Foras na Gaeilge provides the prize fund for the awards while Oireachtas na Gaeilge organise the competition. Gradam Uí Shúilleabháin offers a prize of €4,000 for the publisher and €3,000 for the author while Gradam Réics Carló has a prize fund of €4,000 for the publisher, €1,500 for the author and €1,500 for the artist/illustrator.